A great double-feature in The Peak this week. First almost two-thirds of a page was dedicated to letters defending evolution and rebutting Isaac Seo’s poor arguments for creationism. Give it a full read. 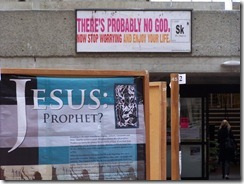 I’m a committed atheist and even I found the skeptic’s banner offensive and tacky. Go study world religions bro, christianity ain’t the only worldview with ideas about sin. Next, I submitted the following piece defending The Peak against the upcoming GSS referendum to cut student funding to the paper. I enjoy that they listed me as an “Associate Staff Contributor” in the issue, but I’m not sure if that’s a typo or if the job requirements are merely having x number of articles published. Either way, I’ll take it. I like being published as much as the next person. Most people enjoy seeing their words in ink. Perhaps the only thing better than having your own words published is having someone else quote you or report news about your mundane life. And yet, these are the exact privileges that graduate students at SFU are now in the position to give up. The relatively new Graduate Student Society is holding a referendum with their upcoming elections that asks their constituents if they would like to remove their per-semester funding for The Peak, and thereby lose, not only their voice at the campus level, but also any chance to promote their views to their community. There are several reasons that some graduate students feel they should no longer support The Peak. The first is that it currently does not represent their views. Very rarely in the past year has the GSS been mentioned in the news, although this may have more to do with the lack of controversy or scandal surrounding the organization. Also, little press has been given to all the various forms of research that is being done on campus. Few graduate students publish comics or editorials, and even fewer write specifically on topics relating to graduates. Naturally, much of the blame for this graduate neglect rests on the shoulders of graduate students themselves. It is not difficult to get an article published in The Peak. Much like those who find it to be too “right-wing” or poorly written, the best way to change the paper is to fire up your computer and send in an article. The big challenge that is facing every graduate student’s involvement in The Peak is very simple: time. Almost every graduate student is strapped for time. Between work ing their thesis, TA-ships, courses, and other work they are committed to, finding the time to write an editorial, let alone research and write a full article, is almost inconceivable. In undergrad, it is possible to extend one’s degree from one to an infinite number of years, so as to spend a bit more time writing for a student newspaper; whereas in graduate school the pressure is on to finish one’s degree and get on with your life. With so little time on their hands, it is somewhat ironic that some have suggested that graduate students could instead publish their own newsletter in place of funding The Peak. It makes little sense that if students are unable to commit the time to write for The Peak that they would instead write for a newsletter with a much smaller audience. Every paper needs a minimal readership to stay interesting and viable; The Peak has those numbers, and I highly doubt that graduate students would be able to achieve anything similar. Many graduate students, regardless of the upcoming referendum, will continue to read The Peak week after week. Rather than essentially stealing the paper, the honourable thing for graduate students to do is to vote to continue supporting the independent voice on campus, so that we can continue to have our issues discussed and represented. The Peak may not be the greatest newspaper ever written, but it remains a strong link between all the constituents of the greater Simon Fraser community. We should vote to keep it that way. I’m still trying to decide if I want to submit a piece on humanist ethics, homeopathy and anti-vaxxers or something else for next week. Any preferences? I just noticed that The Peak also reposted the above article on their “Since 1965” blog. This blog has lots of links challenging the GSS referendum. Apparently Ed Neeland at the University of British Columbia’s Okanagan campus in Kelowna has started a “Creation Club” and has written a big-old-bag of crazy for the local newspaper. First, he misunderstands philosophy of science in that falsifiability is not the only way we actually do science and much of our knowledge is learned inductively. He then decides that evolution is the same as the Big Bang and abiogenisis, neither of which Charles Darwin or subsequent evolutionary biologists have written about since neither of which deal with evolution by natural selection. Furthermore, both are wildly supported by facts and data, including experiments that demonstrate the basis for life. He seems to think that since it’s unobservable in a single lifetime that therefore the Bible is more right. Finally, he obsesses about information again, with no definition of what it is that he’s talking about or demonstration that he even understands how biological evolution work. Somehow, UBC decided to give this man a PhD in Chemistry and then hired him as an Associate Professor. I think they need to refund his money. At least almost all of the comments on his article are trying to actually teach him science. But I’m not even in Calgary yet and I’ve already been confronted over my t-shirt. Walking through security the guard who waved me through the scanner said she liked my shirt, then the guy scanning my bags looked at me and asked where I got it. I replied the Tyrrell Museum and then he asked if I “believed” it. Now, the average creationist is annoying enough to deal with, but you tend not to want to argue with people with guns who have the ability to order full cavity searches on anyone randomly. I can’t find any references to his absurd claims on TalkOrgins.org, but that’s more likely that he’s mixing numerous stories and I wasn’t willing to sit around and be preached at by a security guard. A creationist is using his position to push his beliefs – atheists wouldn’t (and shouldn’t) be allowed to mock people who walk through wearing crosses or other religious symbols. (Note I’m not calling evolution a religious position, but it’s not something we need to debate when you’re trying to determine if I’m a threat to air travel). Someone anti-science is running x-ray machines and granting access to airplanes – two of physics crowning achievements of the 20th century. If you like conspiracies, perhaps you could ask how many creationists are running airport security (and other government jobs) since Harper became prime minister? I doubt it’s higher than the general public. Then Ray Comfort and Kirk Cameron’s Crocoduck Ministry can help. And luckily, they are actually in Canada (I passed their storefront on Hastings St. today in Vancouver). There’s a few places you might know these guys from. Their upcoming ploy to give away free copies, at a University near you, of the Origin of Species, complete with an introduction [pdf] that blames the Holocaust on Darwin. Mr. Speaker, recently we saw an attempt to ridicule the presumed beliefs of a member of this House and the belief of millions of Canadians in a creator. Certain individuals in the media and the scientific community have exposed their own arrogance and intolerance of beliefs contrary to their own. Any scientist who declares that the theory of evolution is a fact has already abandoned the foundations of science. For science establishes fact through the study of things observable and reproducible. Since origins can neither be reproduced nor observed, they remain the realm of hypothesis. In science, it is perfectly acceptable to make assumptions when we do not have all the facts, but it is never acceptable to forget our assumptions. Given the modern evidence unavailable to Darwin, advanced models of plate techtonics, polonium radiohalos, polystratic fossils, I am prepared to believe that Darwin would be willing to re-examine his assumptions. The evolutionists may disagree, but neither can produce Darwin as a witness to prove his point. The evolutionists may genuinely see his ancestor in a monkey, but many modern scientists interpret the same evidence in favour of creation and a creator. Now, can we get a real scientist into the Minister of Science position? How, when I asked what questions the ID proponents in Expelled weren’t allowed to ask, the only response I got was either abiogenesis (which is being studied, but apparently not fast enough) or the fact that high school teachers in the USA are being fired for discussing alternate definitions of a scientific theory, since apparently that is up for debate. While I did actually ask she was implying that in high schools science students didn’t learn about the word theory, she more meant that teachers couldn’t get wishy-washy about theories. When Dr. Lamoureux was preaching the good word of evolution, she cut in and said “what about the Cambrian Explosion?” And Denis just shot back “What about it! ?” and then explained how the “explosion” was 10 million years long and is not that unusual. She sort of backtracked part way through once she realised what she’d unleashed. Finally, how she continually dodged the fact ID people have no evidence in favour of pushing forward the argument of Expelled that there is a “wall” preventing exploration of ID ideas (which again, no one presented anything about). My only response after this engagement was merely “so many creationists…so many creationists…” It looks like Alberta and its University have a few more challenges ahead of it. 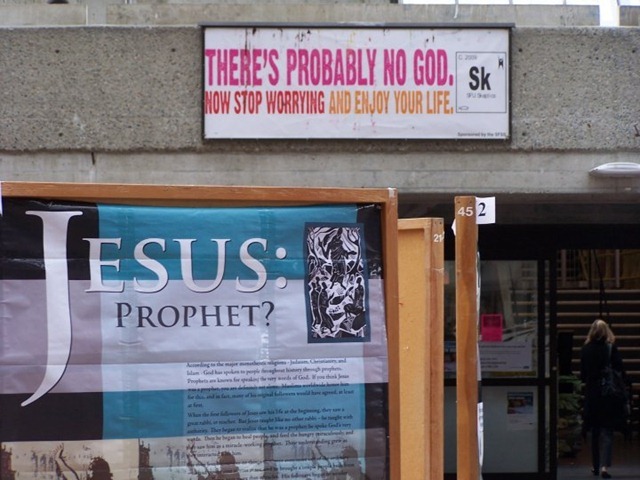 Posted on 31 Mar 2009 31 Mar 2009 Categories Atheism, Creationism, Edmonton, Evolution, Free speech, Links, Religion, Science, UofA Atheists and Agnostics3 Comments on Ignorant movie night at the UofA! It’s been 200 years since Charles Darwin was born. So Happy Birthday big fella! He revolutionized biology and set in place the binding theory that unites all life on this planet. If you’re at the UofA today, check out the awesome Darwin Day festivities put on by the Department of Biology.